For the second time in a week, the Chesapeake Bayhawks survived the “Curse of the Cover” by downing the New York Lizards 16-13 in front of 5,443 on Rivalry Night at Nave-Marine Corps Stadium in Annapolis. Chesapeake’s seventh consecutive win boosts their record to 8-2 and keeps them a half game behind the league leading Dallas Rattlers. The last time the Bayhawks started 8-2 was in their 2012 championship season. So what is this “Curse of the Cover”? Monday night, midfielder Myles Jones graced the cover of the Bayhawks’ program. Despite averaging just more than three points per game (15 goals and 10 assists in 8 games) Jones failed to register a goal or an assist in Chesapeake’s 15-8 win over Boston while committing four turnovers. Saturday night, the man on the cover was face off specialist Stephen Kelly. Kelly entered the game with a .574 face off win percentage and was tied for the league lead in ground balls with 75. Against New York, Kelly won only 11 of 30 faceoffs and picked up just six ground balls more than two below his season average. Colin Heacock opened the scoring for Chesapeake just over three minutes into the game. The 2017 Maryland graduate finished the night with three goals and an assist and now has a team leading 19 goals on the season. A pair of former Terps would combine to give the Lizards their first lead of the game. Joe Walters knotted the score at one and after Steele Stanwick scored to put the Bayhawks up 2-1 Walters found Joe LoCascio who whizzed a top shelf two point shot past former Terrapin teammate Niko Amato. Trailing 5-3, Amato and Chesapeake’s defense clamped down on the Lizards holding them scoreless for more than 11 minutes. The Bayhawks took advantage of New York goalie Drew Adams facing the sun and the best face off string of the evening for Kelly and ran off five straight goals during that span to take a 7-5 lead at the end of the first period that they extended to 8-5 early in the second on Jones’ second of the night. Jones joined Heacock as one of three Bayhawks with a hat trick. 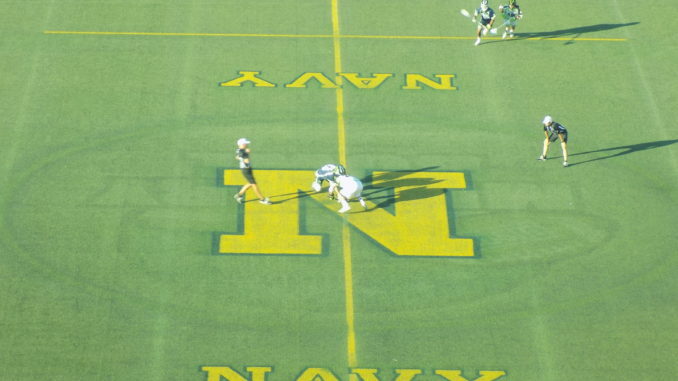 However, once New York’s Thomas Kelly began to win face offs, the Lizards were able to take advantage of Amato now having to face the sun and the Lizards slithered their way to three consecutive scores to knot the game at eight all. A pair of long poles combine to turn the game in the Bayhawks favor. The sequence started when Stanwick forced a turnover and Garrett Epple picked up the ground ball. He found fellow long stick midfielder Sean Mayle racing down the left side and Mayle notched the half’s second two point goal. Chesapeake wouldn’t trail again. A few new but familiar faces also made important contributions. With four players already in Israel preparing for the World Championship Games, the Bayhawks brought back another former Terp. Jeremy Sieverts and promoted UMBC alum Nate Lewnes from the practice squad. Both made their presence felt immediately. Sieverts chalked up a goal and an assist while Lewnes joined Jones and Heacock as the hat trick three. Although the string of consecutive games holding opponents in single digits ended, both the defense and Niko Amato were exceptional Saturday. The defense held New York to just one goal in the third period and Amato finished the night with 19 saves. Chesapeake has the week off and will return to action on July 21 when they return to action to host the Charlotte Hounds to end their four game home stand. Face off is scheduled for 7:30 pm.